While Japanese OEMs persist in their cautiousness, BMW continues its assault on new markets, most recently with its incredible S1000RR literbike. 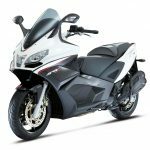 Over the past four years, the German company has nearly doubled its 500cc-plus market share from about 7% to 13%, and the 2011 model year is on pace to set a sales record of more than 103,000 motorcycles. 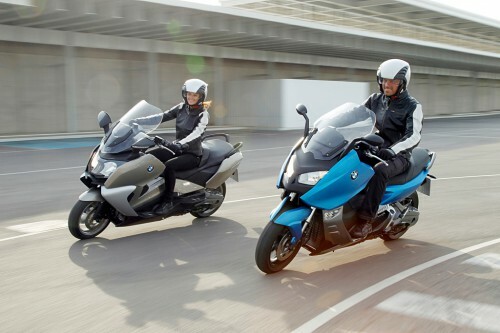 For 2012, BMW enters the lucrative scooter segment with a pair of twin-cylinder maxi-scoots claimed to combine the agility and comfort of a scooter with the riding qualities of a motorcycle. The C600 Sport is, like its name suggests, is the sportier version. 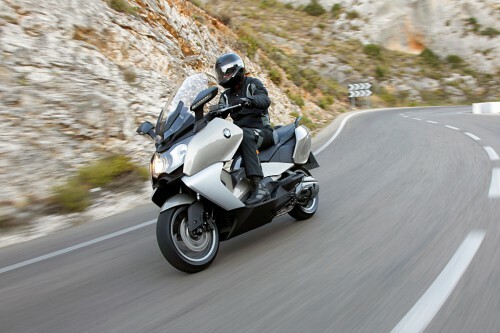 Unlike the implication of its name, the “600” Sport actually uses the same liquid-cooled 647cc parallel-Twin engine as the more luxurious C650GT. Both will be built in BMW’s Berlin factory. 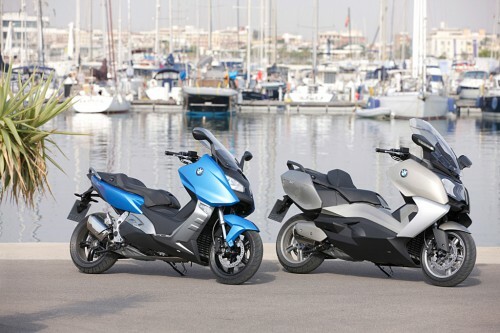 Check out our photo gallery of the new BMW scooters here. 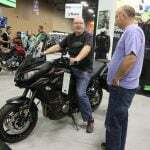 The fuel-injected DOHC motor is claimed to produce a relatively awesome 60 horsepower at its 7500-rpm peak and delivers it to the rear wheel via a CVT transmission and an enclosed, oil-bath chain. The twin cylinders are inclined at 70 degrees for a low center of gravity, with a crankpin offset of 90 degrees and a 270-degree firing pattern. Vibration is quelled via twin balance shafts. BMW says its new engine is the most powerful and efficient engine in its class, and it claims a top speed of a lofty 109 mph. The Sport can sprint to 62.5 mph in a fairly brisk 7.1 seconds, while the 26-pound heavier GT takes 7.5 secs. 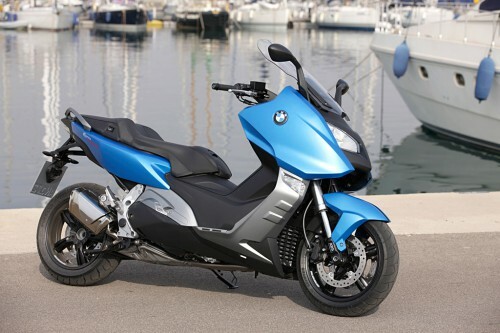 Unlike many scooters, with their small wheels and tires, the C600 Sport and C650GT were designed “to combine directional stability at high speeds on the motorway with playful handling in city traffic and clear feedback to the rider.” The chassis is constructed mostly of a tubular-steel bridge-type frame, augmented by a die-cast aluminum component where the swingarm attaches. The engine also functions as a load-bearing element. Wheelbase is 62.6 inches. A beefy-for-a-scooter 40mm inverted fork is used for confident steering responses, set at a 25.4-degree rake with 92mm of travel, figures akin to contemporary motorcycles. 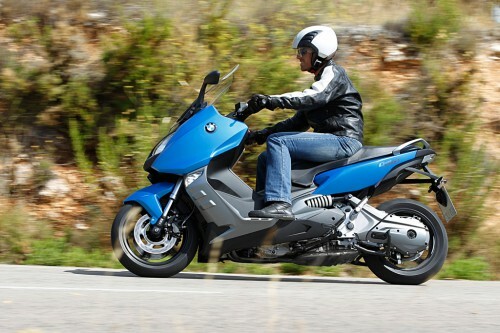 The rear suspension is handled by a lay-down shock offset to the left side and a single-sided aluminum swingarm. Both C models use 15-inch wheels, with tires sized 120/70 front and 160/60 rear. As could be expected from BMW, both scooters utilize ABS brake systems as standard equipment. A triple-disc setup is used, each 270mm in diameter and clamped by twin-piston calipers. 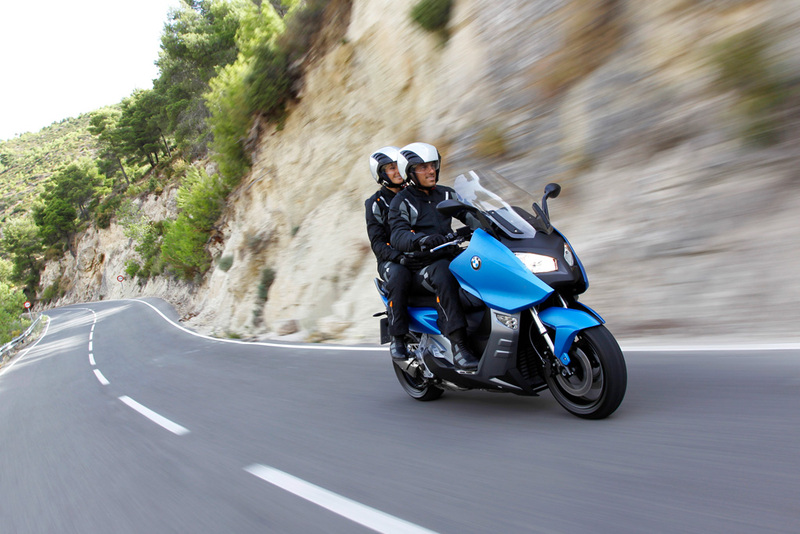 An innovative parking-brake system alleviates concerns about safely parking a CVT-equipped bike on a slope. A second rear brake caliper engages whenever the sidestand is deployed, preventing the scooter from rolling while parked. Instrumentation is the same on both models. A large-digit analog speedometer is complemented by an outsized LCD info panel that includes a fuel gauge (for its 16-liter tank), rate of fuel consumption, oil-level readout, ambient temperature and tachometer. 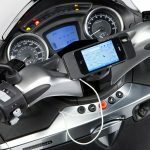 A power socket is standard equipment, and a powerful 588-watt alternator provides plenty of juice to energize optional headed grips and seats. In addition to two preset (high/low) settings, the seat/grip warmers have a new Auto level that delivers heat based off outside temperature and vehicle speed. This variant is intended for riders looking to stretch the legs of a touring scooter over longer distances. As such, the GT has a broader and more comfortable seat, a higher handlebar, larger fairing panels and a bigger windscreen electrically adjustable over nearly 4 inches. Its riding position is more upright than the C600 Sport. Floorboards (rather than footpegs) are used for both pilot and pillion. Seat height is listed at 30.7 inches, and it features an adjustable backrest. 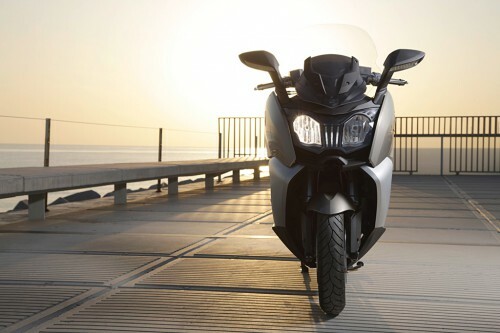 The GT has an underseat storage well with internal lighting that can fit two full-face helmets in its 60-liter capacity. Additional stowage room is provided by a pair of pockets in the cockpit and two others in the sides of the tail. Unlike the Sport, the GT has adjustable air-deflection wings like the K1600s that route air to a rider in hot conditions. Its ready-to-ride weight is 575 pounds. This model is stripped of some of the GT’s visual heft and is missing a few of its brother’s luxury amenities, contributing to its 26-pound lighter weight of 549 pounds. 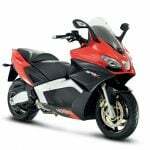 A flatter handlebar and taller (31.9 inches) seat puts its rider in a more aggressive posture, and contrasting-color fairing panels look and are smaller than the GT’s. A three-position, manually adjusted windshield is lighter and smaller than the electric version on the GT. The Sport’s tailsection is shorter and tidier than the GT’s, so there less available stowage capacity. In order to provide enough room to store two helmets, BMW invented what it calls a FlexCase. A flexible flap in the compartment allows it to stretch enough to hold a pair of lids under the seat when the Sport is parked. The FlexCase flap needs to be closed when operating the scooter, and a safety switch ensures it can’t be started unless it is closed. 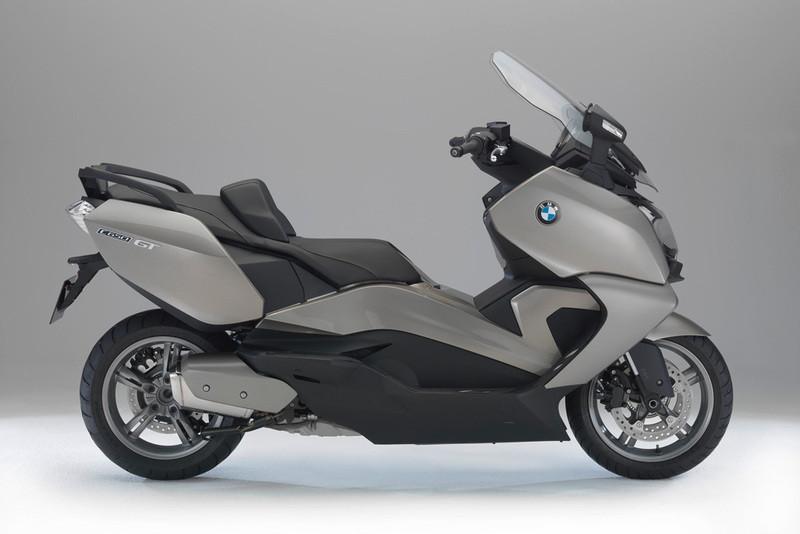 Each model will consist of three colors, and both the C600 Sport and C650GT can be fitted with an optional luggage rack and top case. Pricing is not yet available.